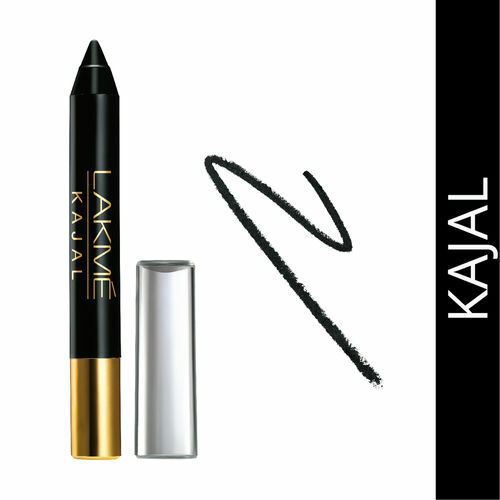 Choose this classic Lakme Kajal for your everyday wear. Outline your eyes with this classic Lakme Kajal enriched with camphor and castor oil that blend together to cool and soothe your eyes. It's easy to apply, it helps you get an ultra smooth finish and you can carry it with you wherever you go!Gives a Dramatic Look to Your Eyes!Eyes speak more than words! It offers a rich lustrous deep blackest black shade to give your eyes a bold look. This Kajal beautifully defines your eyes and gives a perfect smooth finish.Infused with Natural Essential Oils for Healthy-looking Eyes!This Lakme kajal is enriched with a natural blend of camphor and castor oil that helps soothe, freshen and cool your eyes. It gives a lively look to your eyes and keeps them looking healthy and naturally beautiful. This kajal does not irritate or sting your skin.Specially Designed to be Smudge Free All Day!This black kajal pencil is specially formulated to stay smudge free on your eyes. It stays on your eyes for a long time, so you don't have to search for the kajal for frequent touch-ups.Easy to ApplyThis Lakme kajal pencil gives a proper grip and convenient hold for enhanced control during use. It can be sharpened as desired and is easy to apply. Wear this black kajal on your lashline or waterline to get a smokey effect. Lakme is one of India's leading color cosmetic brands offering a wide range of high-end, world-class color cosmetics and skincare products. Lakme has a vast product range specially crafted by experts for the Indian skin. The brand has also been redefining fashion in India for over 15 years with Lakme Fashion Week, India's premier fashion event. Explore the entire range of Kajal available on Nykaa. Shop more Lakme products here.You can browse through the complete world of Lakme Kajal .